NEW HAVEN -- Just like the first, second and third times, the fourth time was also the charm for the Darien High School girls swim team. 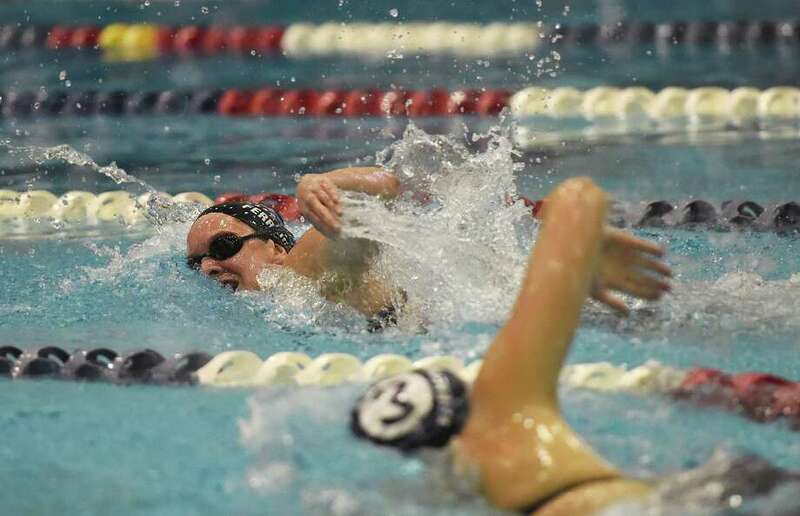 The Blue Wave captured their fourth consecutive Class L girls swim crown Wednesday night at Southern Connecticut State University's Moore Fieldhouse. Darien used Blue Wave after Blue Wave after Blue Wave of its depth to amass an incredible 815.5 points to outdistance New Canaan (570). Cheshire (547) was third followed by Pomperaug (501) and Wilton (477). "We had 13 seniors graduate. So I skeptical on what we could do here in 2014," Darien coach Marj Trifone said. "We had some freshmen step up. But this group embraces the philosophy that we are a team. And they believe that success is a team effort." New Canaan could go home just as proud as their suburban rivals. The Rams won five individual events with Meghan Egan and Katie Colwell as double Class L champs. "We let people know that New Canaan was in the house. New Canaan was a force," New Canaan coach Dave Fine. "Our group swam way above my expectations. The girls worked hard all season. And they were rewarded tonight." What is nice about this Darien-New Canaan rivalry is the friendly, respective tone exuded on both sides. It should be an interesting State Open Championship Saturday night at 7:30 p.m. at the Yale University pool. "We will be a better State Open team than here," Fine said. "Here at Class L, Darien is four deep in every event. At the Open, that won't be the case. The points from our top swimmers will count more at the Open. We will give Darien a run. Give them our best shot." Darien did send a message in the final event, the 400 yard free relay. The Blue Wave quartet of junior Belle Stoebbie, junior Lauren Rutledge, sophomore Phoebe Slaughter and senior Courtney Ferreira set new Class L and state records by winning in 3:29.19. The old Class L mark was 3:30.90 (set by New Canaan) while the state mark set by Greenwich was 3:30.16. "Our school record was 3:32 so going 3:29 is sensational," Trifone said. "The State Open meet should be fun for all." With scoring to 16 places, Darien's army made its presence felt. After five events including diving, the Blue Wave had 313.5 points followed by New Canaan 289 and Cheshire 204. Pomperaug and Wilton tied for 4th at 189 points. After eight events, Darien was down the road with 563.5 points followed by New Canaan (389), Cheshire (329), Pomperaug (323) and Wilton 289. Darien struck first in the 200-yard medley relay as the Blue Wave maintained a slim lead throughout to win in 1:47.90, ahead of Cheshire (1:48.47) and New Canaan (1:48.51). New Canaan earned its first individual win in the 200 free as Katie Colwell was victorious in 1:52.89. New Canaan had another Class L champ in junior Meghan Egan, who captured the 200 individual medley in 2:04.08. Darien's Ferreira (2:07.02) was third. The 50 free ended in a dead heat for first as Rutledge and E.O. Smith senior Siobhan Dale each touched the wall in 24.07 seconds. Egan earned her second Class L gold medal by capturing the 100 butterfly in 56.57. Darien's Maggie Orem was third in 57.28. New Canaan's Colwell collected her second victory by taking the 100 freestyle in 51:16 ahead of Darien's Rutledge 51.54. Colwell's time broke the Class L record of 51.23 set in 2011 by Pomperaug's Elizabeth McDonald. Darien earned its next victory in event No. 8, the 500 freestyle where Ferreira was unstoppable, winning in 5:04.62. Pomperaug sophomore Margaret Flaherty was third in 5:05.91. New Canaan earned more gold by winning the 200 free relay in 1:36.69, just above their Class L record time of 1:36.22. Pomperaug (1:38.76) was second with Darien (1:39.24) in third. Darien owned the 100 yard backstroke as Phoebe Slaughter won in 58.46. Teammate Rebecca Maroney was 2nd in 59.39 with Blue Wave's Maggie Orem in 4th. The 100 yard breaststroke produced a Class L record. Cheshire freshman Elizabeth Boyer won in 1:03.73, smashing the old mark of 1:04.63 set by Darien's Olivia Leunis in 2012.